With the fast growing used car market, it doesn’t come as a surprise if we say that people nowadays look to buy a used car ahead of a new one. This market has been on a rise in the recent past, which is due to the fact that the quality offered by the sellers is high-class. The rate with which the second hand cars market is growing, it is certainly not gonna vanish anytime soon. However, it is expected to see a rise in the months or years to come. But, the question that haunts every second-hand car buyer is that what all factors one needs to consider before going for a used car? The process of selecting and finalizing a used car is a tedious task and requires pondering on certain factors that could affect your decision on a long run. 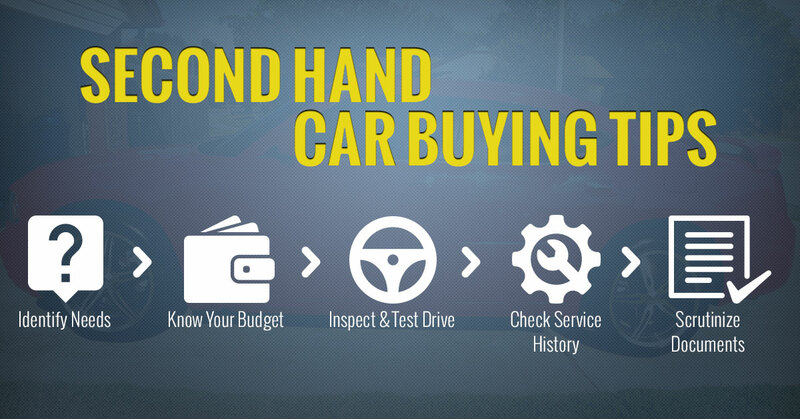 Here are few tips to make your daunting process simple like never before that could help you in making a wise decision while buying a second hand . Buying a new product requires a clear mind process, this case is same with buying a used car. Let your thoughts have a clear winner before you hit to your nearby dealer in order to inquire about the car. Make sure you have shortlisted the segment or probably the model you are willing to buy and research for the same before call a used car dealer. Unplanned scenario could create things more complex, which definitely you don’t want. You need to decide on your budget before making any choice. This would help you to be clear on which segment of cars you want to explore. You would save time on hitting on the specific segment whereas in the other case you would explore cars which would never fall in your budget. This is an important phase of the buying process, especially in case of used cars. Check out for the minor issues with the car’s engine yourself or get a car expert along with you in order to identify the issue, if there is any. Make sure the car hasn’t undergone any major accidents and the rigidity of the car has kept intact. Give importance to the unwanted rattling sounds when the engine starts or while on the go and make sure to confirm it with the seller or dealer that it isn’t any major problem. Although, it is a used car, but as a buyer you need to ensure that the car is in good condition. The condition of the car can be analyzed by not only its present looks but also considering the prior owner of the same and where the car was primarily used. Look out for the dents across the car and also don’t ask to confirm your dealer if the car has undergone any major replacement in terms of parts or equipment. The final phase includes the verification of documents as presented by the dealer. Do a quick in analyzing that all the required documents are intact including, registration papers, insurance and pollution control certification. Also, ask for the transfer formalities you require to perform. Aforementioned are the few things, which need your attention while buying a second hand car for sale. Ensure you perform each step mentioned above before finalizing any second hand vehicle so that the process can be carried out in a smooth manner.